In Part 1 of this series, we provided examples of education marketing videos that stay true to the brands behind them and that deliver effective, strategic messaging. In Part 2, we go behind the scenes, as it were, to look at the strategic questions that should preface the actual creation of videos for international student recruitment purposes. We offer seven substantial tips for getting the strategy right for your video, from initial inspiration to creation and through to distribution and continual enhancements. Technorati found that 59% of surveyed brand managers said their companies are planning to increase video budgets in the year ahead – many by as much as 30%. Consumers clearly want to see video as they make choices about the products and services they will use to define their lives – so it makes sense to craft a solid strategy to make sure your video is doing the best job possible at promoting your institution. Below are our top seven tips for getting the strategy right for your video, from initial inspiration to how it will be distributed. We’ll be aided by an interview we conducted with Mr Florian Schäfer, the co-founder of kommod.tv and a producer and video marketing consultant based in Germany; you’ll see his comments interspersed throughout the tips we provide. Are your audiences in multiple countries? Are they parents as well as students? What about agents? Your audiences’ characteristics, geography, and different needs may mean the creation of more than one video, in different languages, perhaps, or with different emphases. Or, they could suggest that you deliver the video in multiple ways (e.g., for audiences with limited or blocked Internet access, a simple solution could be to send agents a USB stick they can use to show the video to student audiences). Also, think about cultural sensitivities. Schäfer recalled the challenge of videoing a school in Miami for an intended Saudi Arabian audience: “You did not want girls in bikinis on beaches for that one,” he explained. What about people who are visually impaired? Check your institution’s accessibility standards to see what this will mean in terms of captioning and other ways of making your video more accessible. Your video should emphasise the best of what you offer, but stay within the realms of reality. It’s courting trouble to suggest idyllic scenes that are never then experienced by the student when they arrive – it’s not a great step on the road to student satisfaction. Identify one key goal: for example, prompting a decision to choose your university over one of two others the student has applied for. Whatever else your video accomplishes, it must deliver a message that reflects that goal – and ideally, a call to action to make the goal more likely to be met. A more explicit one would be a direct offer to drive immediate response (e.g., “Enrol by 30 April to receive season’s tickets to the orchestra/football games/etc.”). If you have more than one goal to meet, consider a series of videos rather than a stand-alone. Schäfer explains that people’s attention span for a general promotional video taps out at 3–4 minutes, so if you have more to say or show beyond that time frame, consider another video. Schäfer notes the importance of thinking about music and/or audio right at the beginning of conceptualising the video. He often finds it worthwhile to consider music composed specifically for the video, which is less expensive than some might think (e.g., US $500 for a 3-minute video) and has the advantage of being customised for the needs of the video. As for what assets you might have but not know it, Schäfer offers another tip: call your local tourism board. This resource is guaranteed to have the most beautiful images and likely video of your locale and the surrounding landscape, and because international education is certainly aligned with the goals of your local tourism board, they are likely to grant permission for use of some of their material. As much as international education marketing is in one sense destination marketing – because it relies on convincing students of the benefits of a place as much as an institution – it can be dangerous to rely too much on picturesque footage of landscape. Students want an experience out of study abroad – they want to meet people and try new things – so aim to get as much of the experience as you can into your video. See for example this video below that Kommod produced for The Università Cattolica del Sacro Cuore in Milan. It employs student and staff testimonials throughout to reflect the experience of studying at the university. For the implications of this, we’ll simply share… a video! 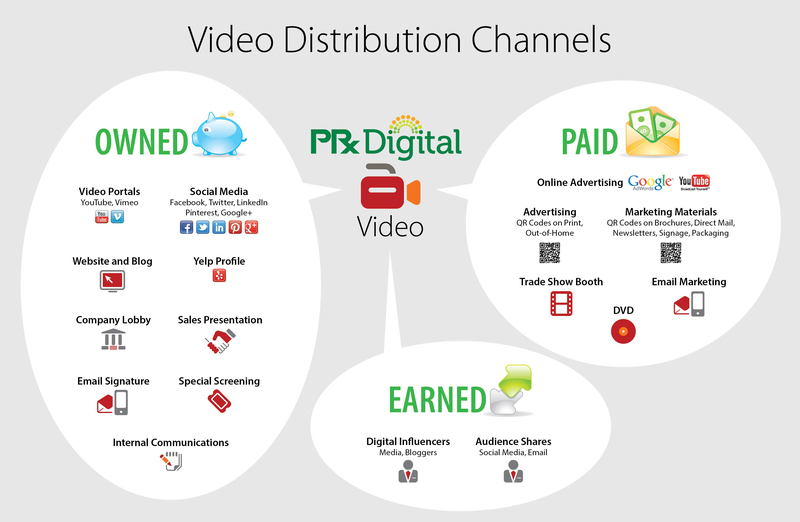 A distribution strategy is crucial for educational marketing videos. Simply popping a video up on YouTube is not going to be effective. Here is an handy graphic that illustrates the range of possibilities to consider, thanks to an excellent post by public relations firm PRX Digital. About YouTube, Schäfer explains that too many people still think of it as a place to watch and post videos. In fact, he says, it’s a social networking site (and the second biggest search engine with 3.9 billion searches a month) and the rules of social networking and SEO thus apply here. Upload each video with an interesting headline, comprehensive keywords and description, and an attractive thumbnail (to generate more interest, avoid using logos as thumbnail images). For more tips on preparing videos online, try this “YouTube 101” article from Huffington Post. There is also the ability in Facebook to create video albums, just like you would create a photo album. The importance of this goes without saying, since we all know how much students use Facebook. As much as YouTube may be the biggest video sharing site, it is not the only site you should be thinking of to upload videos to. YouTube is a major social channel in its own right and the leading service for video sharing, but alternate hosted services, such as as Vimeo, Vzaar, and others, abound. VideoSchoolOnline describes Vimeo as “the artistic sibling to YouTube,” reflecting the platform’s orientation to the arts and not-for-profit producers. Many of these alternate hosting platforms offer a range of customisation options and other special features but also carry a cost, especially for commercial usage. Whichever hosting services you use, it is sensible to make full use of built-in platform sharing tools that will post the link to your video in sharing sites such as Twitter in order to get your video seen by as large an audience as possible. You may also know that you can tweet video links; important since Twitter is an excellent way to promote sharing because retweeting is such an ingrained behaviour. Unable to view YouTube or other hosted international services in cases where such platforms are blocked outright in major markets, notably China. In these cases, video may need to be delivered via local media – such as discs or memory sticks – or posted to alternate video channels. For example, Youku is a major made-in-China platform, and the second-largest video sharing site in the world after YouTube. Consider how you’re going to measure whether your video was successful in its marketing aim. Clicks, views, shares, and comments are the basics, but also think about how many people watched the video the whole way through. Another good idea is to conduct a survey with new students to see what marketing affected them and how (e.g., “Did you see our XYZ video? If so, did it have a positive, negative, or no effect on your decision to enrol here?”). When it comes to tweaking, it can be a good idea to try out different keywords, descriptions, and headlines every few days or weeks – all very fast and easy to change on YouTube. Consider how long you will rely on your video to promote your goal. As the following slide deck from eduGuru notes, “video ages badly.” There should be a plan in place for substituting the video with a fresh one that audiences will click on because they know it’s new. The slide deck is based on a survey that eduGuru conducted in 2011 to gather insights on video usage among higher education institutions. Among its findings: 97% of responding institutions are actively producing and sharing videos. Please see the complete presentation below for additional findings and practical insights to give your video strategy a boost. This entry was posted in Africa, Asia, Australia/Oceania, Europe, Marketing, Middle East, Most Popular, North America, Regions, South & Central America and tagged colleges with international students, student recruitment, student enrolment, prep schools with international students, secondary schools for international students.